The recent Cabinet decision granting widows and divorced women a one-year residency extension without the need for a sponsor will come into effect from Sunday, October 21. The new visa rules aim to give women the opportunity to adjust their social and economic status before leaving the country. Visitors and tourists can also apply for a new entry visa after the expiry of the first one, without the need to leave the country. For widows and divorce, the authority will levy a fee of Dh100 for canceling the previous visa and a fee of Dh100 for one-year residency visa. Regarding the renewal of visa for children sponsored by their parents after completing their university or high school, or after turning 18 years of age, they will be given a one-year residency visa that can be renewed for another year. They have to pay a fee of Dh100 for one-year visa, and another Dh100 for renewing it for another one year. Those who do not meet the above conditions but subject to a special humanitarian condition, they have to pay a bank deposit of Dh5,000. 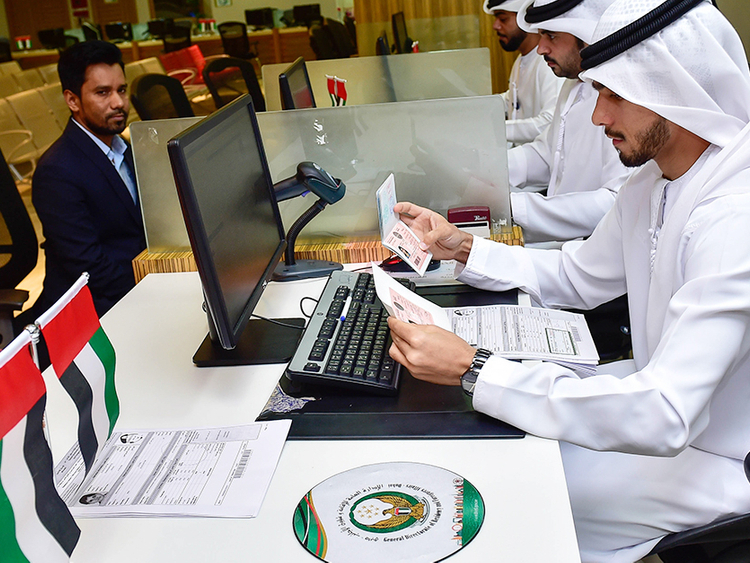 Visitors and tourists can renew their visit visas twice for 30 days, against Dh600 each. In case of violations, visitors and tourists will have to pay a Dh100 per day, starting from 10 days after the expiry of their visas. Abu Dhabi: A new visa system that will extend the residency period for widows, divorcees and their children without a sponsor, for a period of one year from the date of death or divorce, will come into effect soon. The Federal Authority for Identity and Citizenship said on Wednesday that visit and tourist visas will also be extended without the need to leave the country, while students or dependants who are 18 years old will get one-year visas, which will be extendable for one more year. Brigadier Saeed Rakan Al Rashdi, Acting Director of Foreigners Affairs and Ports at the Authority, said extending the residence visas of widows, divorcees and their dependents will be subject to a set of conditions, mainly that they are sponsored by the deceased or the ex-husband at the time of death or divorce, their visas are valid at the time of death or divorce, and that dependents don’t overstay their mother’s visa. Al Rashdi said widows and divorcees without any children may enjoy the same facility. Applications for visa extension for divorcees and widows can be submitted along with the divorce or widowhood certificates, tenancy contracts, and medical fitness certificates for themselves and their children, Emirates ID cards, insurance and income certificates. The fees will include visa cancelling charges and Dh100 for a one-year residence visa. For students sponsored by their parents, Al Rashdi said students who graduate from their universities or secondary schools or complete 18 years of age, will be granted a one-year residence visa, renewable for another year from the graduation date or on completing 18 years. Dh100 will be charged for the visa and similar fees for the renewal, but no bank deposits will be required. Duly attested graduation certificated from universities or schools, both inside the country or overseas, are needed. Al Rashdi said that all types of visit and tourist visas, regardless of their validity, will be extended for 30 days twice. Dh600 will charged for each extension. Those who overstay their visas will have to pay Dh100 fine for each day of their overstay, to be calculated 10 days after the visa expiry. A visitor can then apply for the second extension before the expiry of the fist visa. Al Rashdi said this decision does not cover visitors who are resident in other GCC countries, or those on special entry permits and the 96-hour permit for special missions. Applications for all facilities can be submitted online via e-channel, Tas’heel offices and residency departments across the country. Al Rashdi predicted that the three decisions will contribute towards supporting the country’s tourism sector, as it enables tourists and visitors to spend more time here. It will also support the labour market by providing the opportunity for organisations to benefit from skilled and talented people already in the country and reduce the need to recruit workers from abroad, saving time and costs. Visitors seeking jobs in the UAE also get a longer period of time to find suitable opportunities.